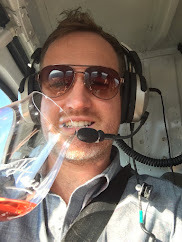 This list of Top 10 Wines from Croatia comes from a ravenous adventure through Croatia last October, during which I threatened the small nation's food and wine supply: If only I could have drank more! I'm warning you Croatia, I'm coming back. At least I can get several of these wines in the United States. I hadn't planned on putting an equal number of reds and whites on this list—Croatia produces more white wine than red—but you'll find five of each. With each wine I also share basic grape info. Croatia's grapes may have freaky names, like debit, graševina, plavac mali, and marastina, but their flavor profiles are downright homey. Picture this: You're sitting in your backyard on a warm June evening with a glass of light, fruity graševina. Or this: You're grilling up ribs with a tangy BBQ sauce that pairs perfectly with a bottle of teran. Mmmm... Croatia! Matošević Winery's 2008 "Grimalda" (50% Chardonnay, 25% Istrian Malvasia, 25% Sauvignon Blanc) - This was one of my favorites whites of the trip. It is barrel aged and shares some characteristics with California-style chardonnay. The wine's powerful acidity cuts through the toast and butter, allowing the intrinsic quality of the other grapes to shine through on a long finish. The wine is medium bodied and dry. I got aromas of buttered toast and dried flowers and flavors of luscious white fruit, especially peach. The grapes were grown in central Istria. The most famous Istrian wines are made with Istrian malvasia. 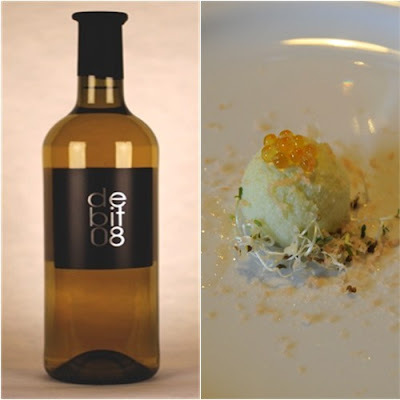 Istrian malvasia is one of 84 different types of malvasia found in the Mediterranean. Sladić Winery's 2009 Marastina - The marastina grape is prevalent on Croatia's Dalmatian Coast, particularly on the island of Korcula. This wine's grapes were grown in Krka National Park on mainland Croatia, just outside the city of Sibenik. The wine is dry and full-bodied. I found aromas of peach, honey, and almonds, with flavors of ripe fruit and an almost oily texture that was very pleasant with food. A unique wine that pairs well with seafood, especially seafood served with Dalmatia's buzara sauce. Antun Adžić's 2010 Graševina "Vallis Aurea" - Likely the most planted white grape in Croatia, graševina has an unknown history, but today it is planted throughout central and eastern Europe. This wine was medium-bodied and verging on off-dry. I got aromas of petrol, grapefruit, and bright fruit, and I tasted honey-dew melon followed by a crisp acidity. The wine was exceptionally clean and bright. Adzic's graševina grapes were grown in the Pozega valley (Vallis Aurea in Latin), in inland Croatia. Krauthaker Winery's 2008 Pinot Crni (100% Pinot Noir) - The wine was light bodied and dry with a soft mouthfeel. I got aromas of smoke and roses, and the flavors of fresh plum, sour cherry, and smoke. It was round with soft tannins. Krauthaker's pinot noir grapes were grown in the Pozega Valley, aka Vallis Aurea (shown on the wine label below), in the famous Slavonia region of Croatia. Slavonia has a long history of producing excellent wines as well as the top quality Slavonian oak used to make wine barrels. 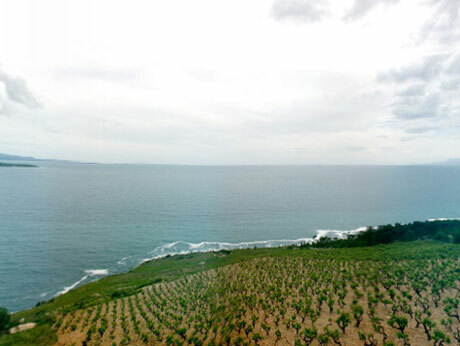 The 45th parallel, the same longitude as Burgundy in France, runs across Croatia, and pinot noir is planted throughout the country along this line. Croatia is not known for pinot, but this one is great. 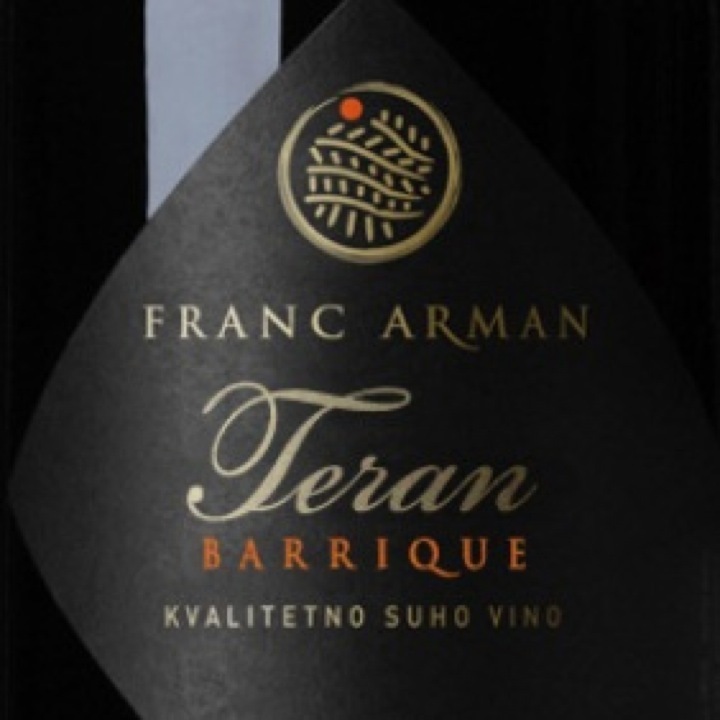 Franc Arman Winery's 2007 Teran "Barrique" - In 1999, Franc Arman's Teran "Barrique" became the first teran wine to be aged in oak barrels. The wine is dry and full bodied. I got powerful aromas of juicy, dark fruit. The tannins are middle-ground, capable of pairing with beef involtini or other big-flavor dishes (the local prosciutto, called pršut, is a favorite). The tannins were also friendly enough that you could drink the wine sans food. Flavors of juicy blackberries, a little vanilla, and baking spices, like nutmeg and cloves. In Croatia, the teran grape is primarily grown on the Istrian peninsula. 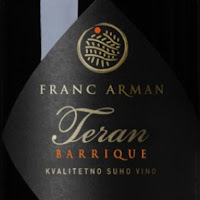 The northern part of the Istrian peninsula is Slovenia, where teran is used to make a wine called refošk, which clues us in to the fact that teran is related to Italy's refosco. Just how related it is is debated, and the grape is sometimes called Istrian teran because the local soil, a mix of red, brown, and white soils, changes the qualities of the grape. In Istria, it is also common to grow international grape varieties such as cabernet franc, merlot, and pinot noir. Matuško Winery's 2007 Dingac (100% Plavac Mali) - This austere wine represents the Dingac growing region very well, and it isn't going to break the bank like so many Dingac wines (that is, if you can find it—try Dubrovnik). It is bone dry and full bodied. I got balanced aromas, with notes of chocolate and dark fruit. The wine is rich and earthy, with some chocolate. This wine needs to be decanted: an unpleasant cola flavor that was present at first that went away with time. The Dingac growing region is located on the Dalmatian Coast on the Peljesac peninsula, and it centers on the town of Potomje. This fall, Edible Authentic Travel is taking Italian food lovers on a culinary tour of Rome and the villages of Umbria. 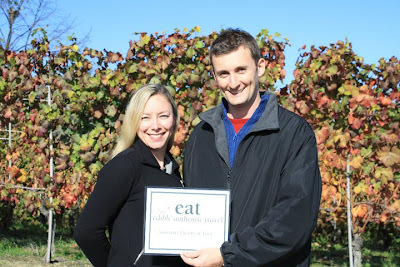 I met Heidi Spurlock-Burnette, co-founder of Edible Authentic Travel (EAT) culinary tour, during an Italian supper club, viz. party, that my girlfriend and I threw at our home. Over a smorgasbord of traditional Pugliese antipasti and steaming bowls of homemade, sausage-stuffed tortelli with sage-butter sauce (did I mention wine? 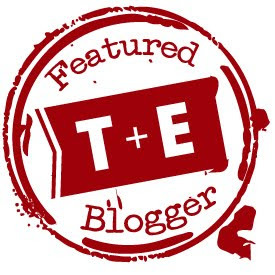 yeah, lots of wine), Heidi shared her philosophy on culinary tours: Take a small group of people who love Italian food and wine to the small towns that she and co-founder Marco Scaglione, a Piedmont native, absolutely love. To be honest, I’m not a fan of most culinary tours. The idea of getting on a bus with 30 other random people and trying to share an intimate Italian experience seems like pursuit destined to fail. But that’s not what EAT is all about, and I think it’s time that the people putting together great culinary tours in Italy obliterate the bad name given to culinary tours. Heidi and Marco are two such people. The things I love about Rome are spaghetti carbonara, amatriciana, carciofi alla giudia, Pecorino Romano, malvasia, trebbiano, and porchetta sandwiches. EAT’s culinary tour begins by visiting the Roman neighborhoods known for cooking and serving these killer dishes and wines. The Jewish Ghetto is full of hole-in-the-wall restaurants, some of which do not even hang signs outside their doors, and this is why it helps to travel with professional foodies. Heidi has worked as a tour guide in Rome for seven years. Umbria is a quiet region. Its rolling hills are covered with Italian cypress trees and a patchwork of agricultural land. I love Umbrian food, and its wines really blow me away. The culinary tour travels through the Tiber Valley, visiting the famous town of Assissi—a darn cute town full of churches and expansive views—before hitting wine country. The Sangrantino di Montefalco DOCG, made with the sagrantino grape, is famous for its small but fervent following, viz. it’s a true cult wine. Heidi will take winos and winas (I apologize for this neologism) to these small wineries, plus there will be olive oil and cheese tastings. What could be more exciting than eating in the best Umbrian restaurants and drinking the best Umbiran wines? Oh: A chocolate festival! The Rome and the Villages of Umbria Tour will also visit the EuroChocolate Festival, sampling the world-famous chocolate of Perugia. For more information on the Rome and Umbria culinary tour, check out Edible Authentic Tour’s website or, if you live in Portland, Oregon, come to the wine tasting that Heidi and Marco will be leading at Magnolia Wine Bar this Saturday, January 21st. EAT’s Rome & The Villages of Umbria culinary tour is scheduled for October 14-21, 2012. I remember the giant wooden gates clearly; they led into a courtyard that may or may not have been unpaved—may or may not have been made of sand. A cold wind from the distant mountains was whipping across the hilltop, and we had to struggle to open and close the door into the tasting room. Alen and Šime Petrović welcomed us to a set table full of open bottles—the night’s tasting. Thousands of descriptors could be used to describe BIBICh’s wines, but, for me, the clearest description is this: BIBICh wine dances. It is lithe and bright, and it stood in direct opposition to the weather outside. It is unusually low in alcohol and features little-known grapes, such as the white grape, debit. Alen said he foresaw a good future for debit. “People, over time, will get to taste more,” he predicted. To accompany the wines, a tasting menu had been prepared by Alen’s wife, Vesna. Anthony Bourdain was slated for the next night’s dinner. He’d been trailing in our olive oil dust for days. The first pairing was fresh oysters and BIBICh’s sparkling N/V Brut, made with 100% Debit and crafted using the champenoise method (it is not imported). I didn’t like it. The flavor was dull. However, the texture was surprising and unlike anything I’d had before: it felt like drinking wool. Vesna had prepared local oysters. Half were simply cracked then left untouched, while the other half were covered with Worcester foam. This was the first taste of Vesna's incredible molecular gastronomy. Next up was the 2010 Debit varietal ($16) paired with a cucumber granita on a bed of sprouts topped with trout roe and smoked trout shavings. The dish’s fruit and smoke flavors paired perfectly with the extremely nimble, dry wine. I tasted butterscotch and bitter lime peel, and it was chalky and a bit grassy. It was astonishing. The northern Dalmatian Coast seems to have a similar growing environment to Puglia, Italy, which is located across the Adriatic Sea. Ground water lies as deep as 200ft, the summer sun is brutal, and the topsoil is shallow, but the cool wind of the sea stops the grapes from maturing too fast, maintaining acidity. The fruit creates wines with numerous, intense flavors that are good for food pairing. The 2010 Debit is a high-value wine. Next, we tried the 2009 R5 Riserva ($18)—a blend of debit, marastina, posit, chardonnay, and pinot gris—with sea bass tartar flavored with orange and chili pepper. Aged for one year in American oak, the R5 was made in international style, with some toastiness. I didn’t find that the oak obscured the intrinsic flavors of the grapes. It was dry with nice fruit on the nose. I tasted vanilla and felt strong mineral textures. A solid food wine. Getting down to business, Alen brought out the single-vineyard 2008 Lučica (100% debit - $25) paired with the area’s famous scallops (I’ve written all about Sibenik’s seafood here), which were served on and under disks of semi-hard goat cheese. The scallops were peppered with black sesame seeds and doused in sesame oil. 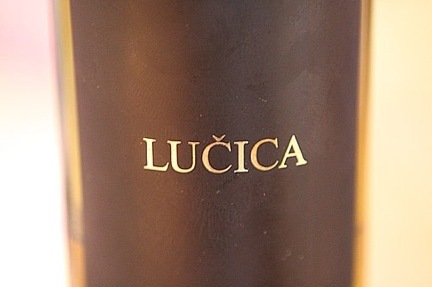 Lučica features fruit from one of the few vineyards that wasn’t devastated by the war. BIBICh’s importer to the U.S., Blue Danube Wine, says the vineyard has 47-year-old vines. Alen explained that each plant in the vineyard produces enough fruit for half a bottle of wine, and that he does not press the fruit. That’s highly concentrated fruit plus top notch free-run juice which equals an insanely bright wine with a viscous texture and an almost interminable finish. The brightness corresponded with a saline quality that brought out the flavors of the tangy goat cheese, which in turn brought out the flavors of the scallops. Aged in new American oak for one year, Lučica was also toasty on the nose. This next pairing was even more ridiculously awesome: the 2008 R6 Riserva (the first red of the night; a blend of plavina, babich, and lasin - $19) with cuttlefish linguini over Paski cream topped with olive oil foam and almonds with olive oil dust and black truffle and balsamic reduction on the side. The cuttlefish was boiled for nine hours in its own ink then put through a pasta machine; it glistened like black latex. The flavor wasn’t fishy, just reminiscent of the sea, and it was a lot of fun recreating the flavor profiles by mixing it with more or less of the dish’s other components. I have no idea how one creates olive oil dust, but my hat is off to you, Vesna. The R6 was slightly hot on the nose—not unpleasant but surprising for such low alcohol—and very rich in the mouth, with flavors of plum. I see this wine aging well over the next five years. The next course included two wines: the 2005 Sangreal (100% merlot - not imported) and the 2008 Bas de Bas (80% Sirah, 20% local varieties - not imported). They were paired with lamb encrusted with hazelnuts, which was served beneath a brittle and over chive oil. The brittle was comprised of “the mix of the boss,” which Alen described as a major Mediterranean mix of 25 spices, but I’ve never heard of it (fill me in if you know). The Sangreal again danced, with a little raisin on the nose. It was dry, medium bodied but light in character, and had a big finish. The Bas de Bas was rich and more concentrated, yet also retained the light character. The Bas de Bas is a serious wine. The final course featured the N/V Ambra dessert wine (100% debit - not imported) and a crema catalana with a chocolate cake. Ambra is produced by drying the grapes on mats then pressing them—several months later—in July. The wine was pure Mediterranean nectar. A nose of burnt caramel paired well with the burnt caramel of the cream catalana and the peach and apricot flavors enhanced the chocolate cake. When we left BIBICh winery, a giant red moon was rising above the clouds. The wind was cold. I was drunk. Go visit BIBICh damn it. A tasting just like the one above costs between 100-120 euros. It's a lot, but it embodies my philosophy of Ravenous Travel: An elite food experience at an incredible value. Contact the winery directly or a tour company like this one. Note that the wines cost up to 40% less when bought on location. I just want to point out that I understand the gravity of saying that BIBICh winery provided me with my best culinary experience. I traveled through Croatia, Slovenia, and Italy—three countries with exceptional food—eating at 5-star restaurants and even visiting the white truffle fairs in Istria and Alba, where I was served tasting menus featuring fresh white truffle. This article is long because the experience warrants it.